So much for that slow start to the season for Stephen Piscotty. 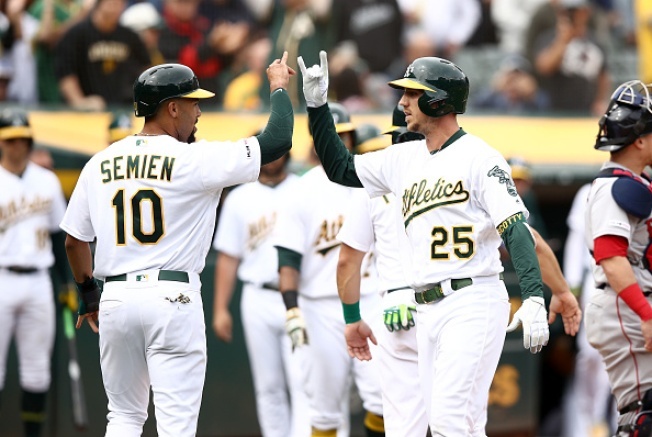 The A's right fielder exploded for four hits Thursday, including a home run and a double, and five RBI, leading Oakland to a 7-3 win over the Red Sox. The four hits and five RBI both matched career highs for the 28-year-old. "[I was just looking for] something over the middle," Piscotty said of his three-run home run in the third inning. "In that situation, you want to get something up in the air and drive in that run no matter what. A home run is the best case scenario there. I was just trying to get the ball elevated." Through his first nine games of the season, Piscotty was only batting .200 with one home run and four RBI. On Thursday, he more than doubled his RBI total and raised his batting average to .282. "I'm starting to see it a little bit better and my rhythm was good," Piscotty said. "I got a couple of lucky breaks, not gonna lie. But that's baseball. Sometimes they bounce your way, sometimes they don't. I was able to get some good pitches I felt like I could do damage on and just tried to put my best swing on it." Added A's manager Bob Melvin: "Big day for him. He hits the homer to center. Rodriguez is a tough guy on us. He was one of the few guys who actually had some good at-bats off of him. The homer was huge. Now all of a sudden we're back in the game. ... It ended up being a really nice day for him." After primarily batting sixth last season, Piscotty has moved up to the number three spot in the A's lineup this year, replacing Jed Lowrie. That would cause many players to start pressing, especially after a slow start, but Piscotty has managed to stay even-keeled throughout. As for the team, the A's finished off an impressive 6-2 homestand with series victories over both the Angels and Red Sox. "I'm not going to complain about six out of eight," Melvin said. "Four-game series are hard to win." "It was a great homestand," added Piscotty. "Winning four-game sets are tough and we did that twice." Smile, that's another series win!